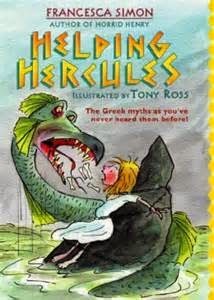 Helping Hercules, by Francesca Simon (new edition from Orion Press, September 2014, ages 7-9ish) is a fine example of mythological time travel for the young. Susan is not a helpful child, not the sort of useful, pleasant child one actually wants to have around. She slams the door a few extra times when sent to her room (just to make her point), she doesn't think grown-ups should be the boss of her, she doesn't think it necessary that she be responsible for any domestic tasks. She's really more of an Ideas person (with her main idea being that she shouldn't have to help)....which her family hasn't learned to appreciate. "This is boring, thought Susan. This is very boring, she thought, some time later. This made me chuckle. Lots of the book made me chuckle--the Greek heroes (except for Perseus) are such stuck up snots, or else rather wet, like Orpheus, that it was nice to see them helped by/saddled with obnoxious Susan. And actually Susan rather grew on me--not that she Learned Life Lessons, exactly, from her time in the mythological past, but her brisk egocentrism and forthrightness made a nice foil for the heroic egocentrism she was paired with. Anyway, it's a nice, zippy, funny book, and I enjoyed it at this point in my life and it's easy to imagine lots of kids enjoying it too. Freeze tag! Which is probably close enough to get the general idea. This one does sound fun.